An angry Hatters caretaker boss Andy Awford was ‘livid’ with his players after they fell to a 2-0 defeat at Bristol Rovers this afternoon. With an hour gone, although not looking like scoring themselves, Hatters remained firmly in the game, until conceding twice in 12 minutes. The first came from a corner, as Tom Lockyer’s header was cleared off the line by Jake Howells only for the unmarked Rory Gaffney to blast home. Then, with 72 minutes gone, keeper Mark Tyler’s error saw Gaffney make it 2-0, and Awford didn’t mince his words in the post match press conference, saying: “I’m livid with them today as we shouldn’t have lost that game, the way we conceded the goals are very disappointing. “It goes without saying when you get beat you’re never happy, but the manner in which we lost the two goals leaves that sour taste. On the manner the goals were conceded, Awford continued: “You can’t odds that, people are told who to mark at a set-pieces and a corner comes in, and it’s a free header. “Jake (Howells) does his job on the post, which is why you have people on the post and then the guy who smashes it in the back of the net is in two or three yards of space. “Mark’s then spilled one and I don’t care who’s stood in that dug out, if you don’t do your basics right, as a team out there, which they haven’t today in that respect, you don’t win football matches, it’s as simple as that. “I look back to the Exeter goal that came from a set-piece, we’ve spoken about that and worked on that. “I’ve only been it in a short time of course and you’re not going to change everything in one day but you’ve got to do better with the basics. 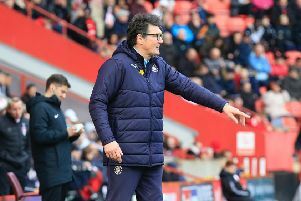 On just why Hatters are continually making error after error in defence this term, Awford added: “Concentration, focus, there’s a great group of lads there in terms of people, they’re a really good group to work with, they give you everything they’ve got, but they’ve switched off at a vital moment and you can’t odds that. “As a manager you set your teams up, as a caretaker manager you set your teams up, and you have a gameplan.